I bought my plans in May 2018 but didn't start to build till October as the summer is busy with beekeeping,model plane flying and gardening. 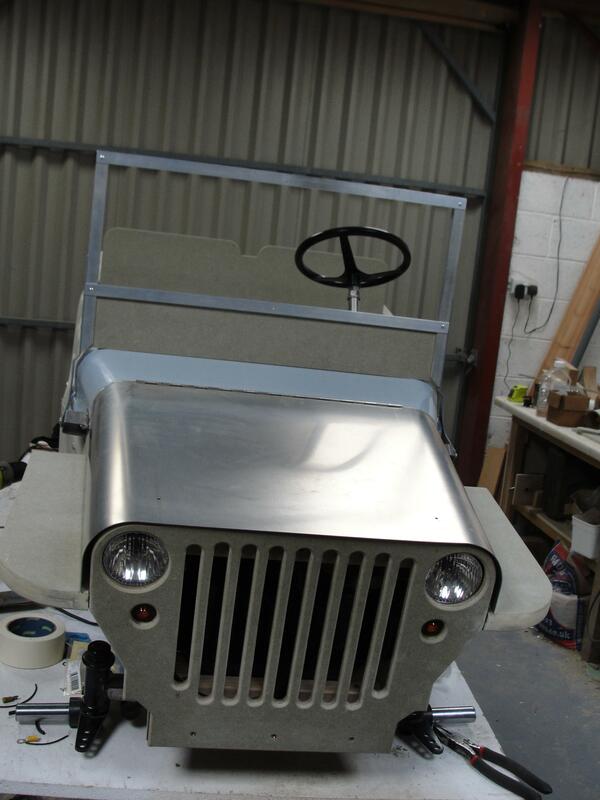 This jeep is being built for my grandchildren of which there were three when I started and five now! Better get this one done and start on a trailer! I have bought a Rascal Voyager mobility scooter as the donor unit. It's an 8mph model so I'm going to mount the speed limiting pot under the bonnet so I can set the appropriate speed and lock it away from little hands. I've also found a key fob operated relay to shut it down remotely if there is an emergency or argument over who's turn it is. I bought 3 sheets of mr mdf because I didn't know how tight it would be to get all the parts out of 2. I didn't need the third sheet at all! To start with I redrew all the parts on cad and did dxf files of each part. I'm lucky to have a neighbour who has a cnc router that I could use to cut the parts. ( I poured and finished his concrete shop floor. One hand washes the other.) All the mdf parts except the floor were cut using the router as it was too big. Right, enough waffle, here's some pictures. Parts and plans ready to begin. Tip: number parts as you cut them for quick reference later. The plans are great but it would be helpful if the parts in the assembly drawings were numbered. Inner front wings fitted. I dry fit many of these parts as this was my first build and once glued they are permanent, right or wrong! 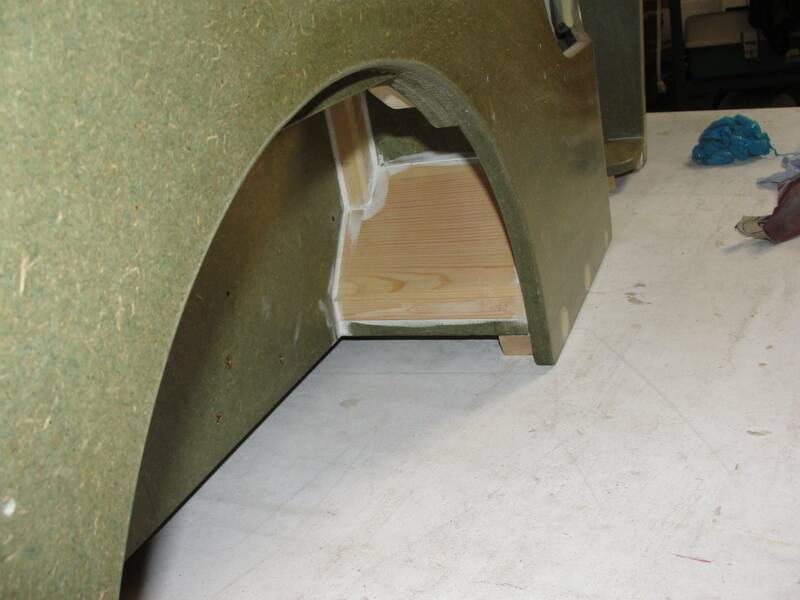 When fitting the inner front wings it's a good idea to cut some spacers to hold things square and at the right width. Check fit by holding front panel up to it. Proper planning prevents poor performance! More pictures to come. Watch this space! Hello Andy, looking good.plates are in the post, might be a couple of days cos we only had 2nd class stamp. Here's a pic of the plates on the glovebox lid. 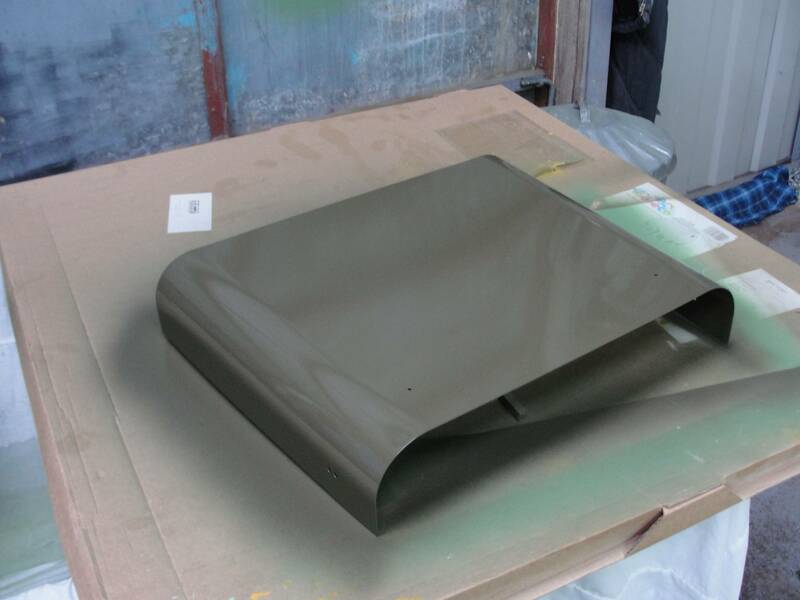 the lid was made from 4mm aluminium with the edges rounded off with a file them emery . I used a quasar remote relay with 4 channels and you can have them momentary or latching, and it works at a good distance. I used a 4QD controller for the scooter motor, and although I fitted a disc brake on the drive shaft it's not needed because the controller has regenerative braking which is the dogs danglers. I also fitted an engine sound generator which can also be switched off via the remote. Thanks for the nomenclature. What sound generator did you fit? Does it sound right? Some I've heard are more like a diesel than the 4 cyl petrol that's in the jeep? I'd fit one if the sound was realistic. Any input would be appreciated. I think I got them from Technobots site. There's a few different programs and also the ability to set your own, cylinders are from 1 to 6 petrol or diesel. The speaker makes a big difference, it has a cranking sound when turned on and the horn sound cuts the engine sound when operated, the horn is programmable as well. The only drawback is you have to have a separate linear pot to work it. Thanks Mick, I'll probably get finished building first and maybe add the sound later. I have a few minutes so I'll add a few pictures. Front axle is modified scooter axle. Thanks, I've seen your builds, so I'll take that as a real compliment! Scooter axle modified and installed. Headlights, plenum and rear top baton added. Bonnet supports fitted with gorilla grip fill. Using Perspex to lay out switches. 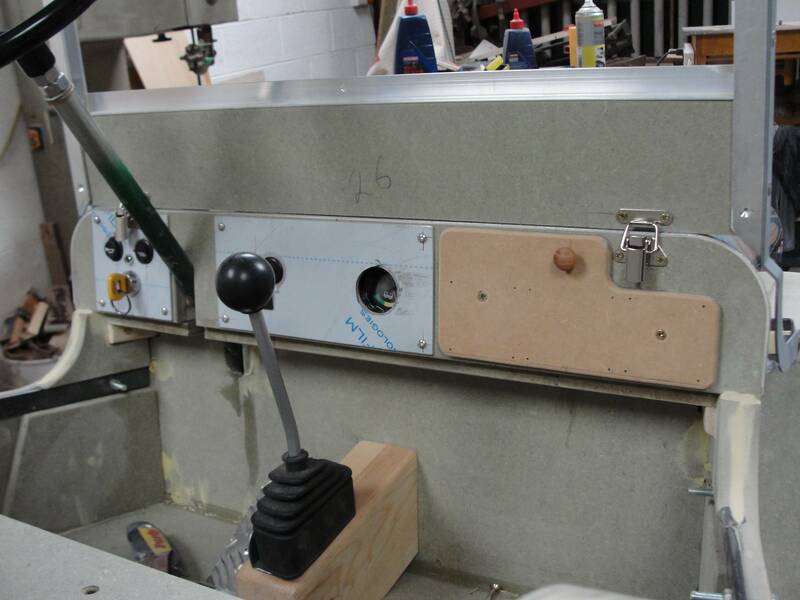 Instrument panel made from aluminium. Wheels fitted ready for wiring before strip down to paint. 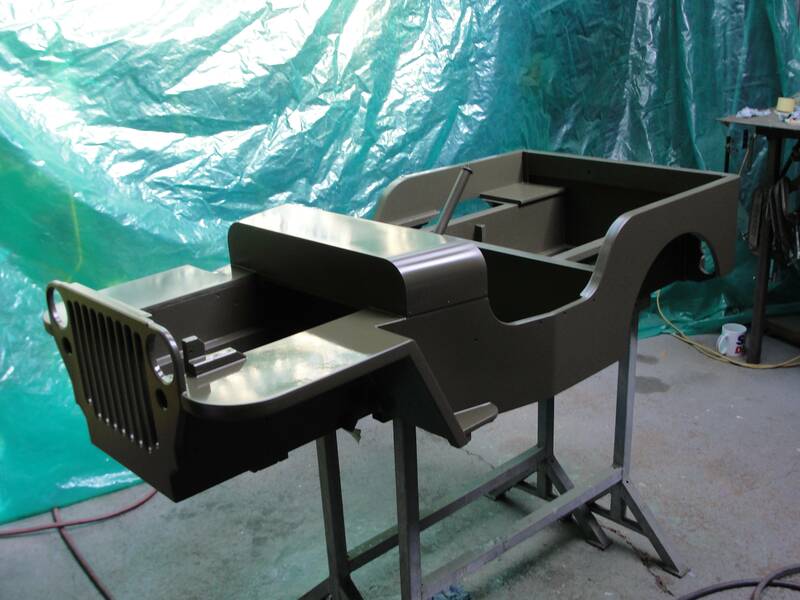 Your jeep is coming along nicely - good to see another builder posting details of their project, especially a jeep which have been in short supply on here. Here are some more pictures of the jeep build. Bonnet, headlights and windscreen test fitted. I've also fitted front indicators. I've fitted these blocks into the front of the rear wings as there was a flat shelf here that could hold mud and be hard to wash out. 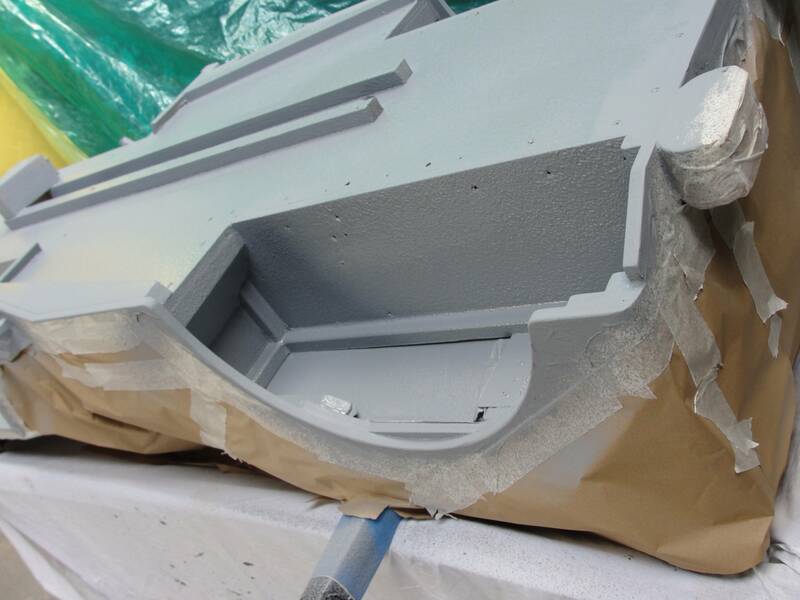 Bottom sprayed with U-pol Gravi Tex stone guard and flatted along edges and at axle mount points with foam roller. The wooden batons in the centre are where I will run the wires rather than in the footwell. Must walk dog, more pictures later. Back from dog walk, more pictures. Finishing process: sealed with rustins mdf sealer 2 coats with sanding to denib between coats 600 grit. All corners sealed with decorators caulk. 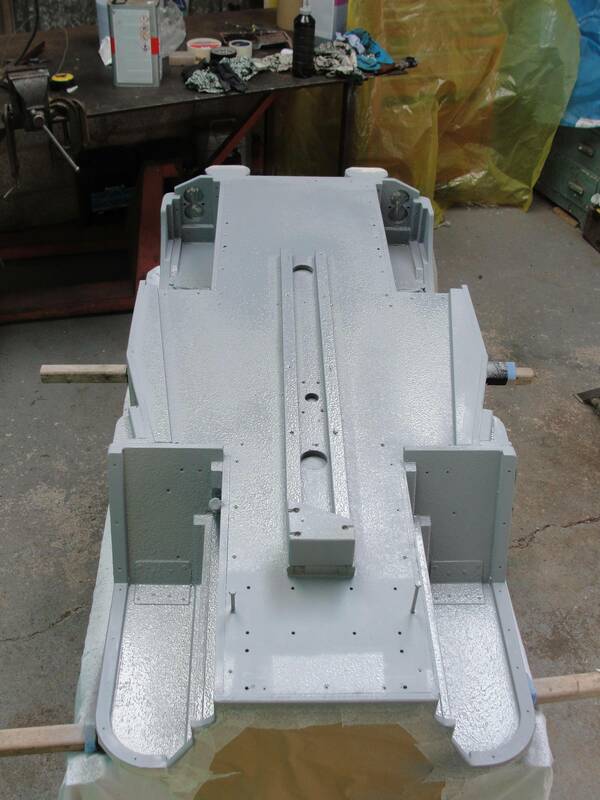 Bottom sprayed with stone guard to protect, seal and waterproof. 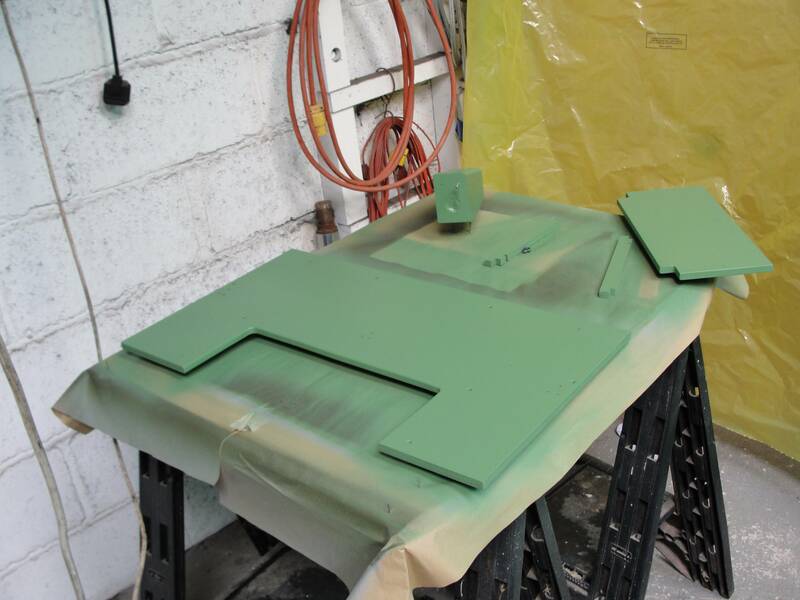 Bottom primed with one coat of paintman synthetic undercoat (green) then top coat with Olive drab no.2 satin coach enamel also from paintman. Top primed with 2 coats of same undercoat but wet sanded with 1200 grit between coats then sprayed with topcoat. 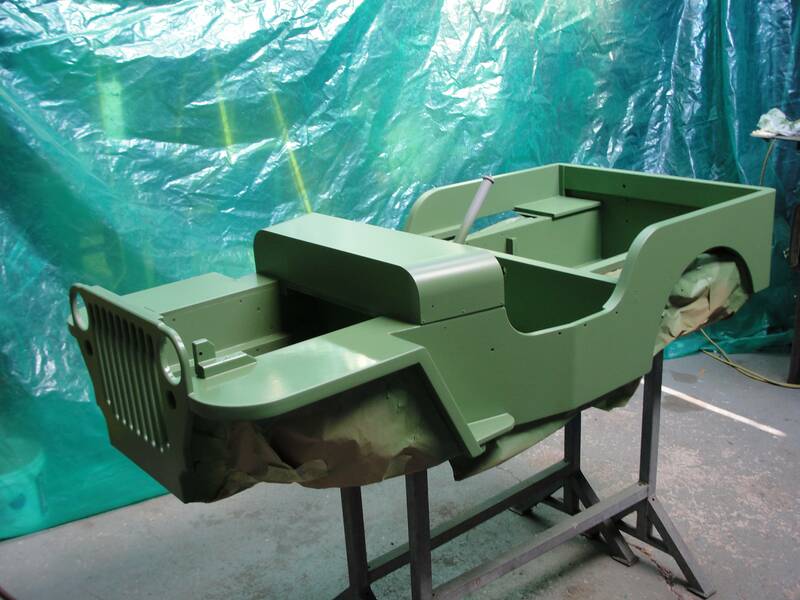 Quite happy with the tub but got a blob dropped onto the bonnet so will flat and respray. Will spray all the small parts and tops of the seat panels tomorrow if all goes well. Then refit everything and test.